Our rent & buy scheme has helped many people start out in the catering business and is designed to allow you to start up in this exciting business without the significant outlay of purchasing a catering trailer outright. You initially only commit to 12 months hire and when you are happy that your new business is working you can transfer to a 3 year commitment and brand new trailer – which will be yours at the end of the 3 years. You originally commit to take a hire trailer for 12 months. This scheme applies to any size Catering Trailer. Anytime after 8 months when you are comfortable that your business is working and you are enjoying it you can convert to a new trailer. This trailer will take approx 2 months for delivery. At this point you commit to 3 years hire. You also have the option of keeping the hire trailer and this becomes yours after 2 years. When the new trailer has been hired for 3 years, or existing hire trailer for 2 years the hirer can buy the trailer for the equivalent of 1 month’s hire at the end of the rental period. The following conditions must have been met to take advantage of the Rent to Buy scheme. On the original hire agreement the 3 year Rent & Buy Scheme must have been selected as an option. The Hirer originally commits to a minimum of 12 months hire and 36 months hire when and if new trailer ordered or 24 months for existing trailer. Monthly up front payments must be paid by standing order with the exception of the first month which must be paid in cash upon delivery of the trailer. A pre-used trailer is delivered on day one. After 12 months or at the earliest at the end of month 8 the new trailer length can be decided and at the end of the next 4 weeks the internal spec must be agreed. The new trailer will be delivered during the third month after deciding the length. This new trailer is the one that is available for purchase at the end of the 36 months. All prices are based upon our standard specification trailer, spec available on our website. If a larger trailer or more internal equipment is ordered this will be reflected in the monthly payments. To take advantage of this scheme you will have to give a £2,500 preparation deposit for 10 & 12ft trailers and a £3500 deposit for 14,16 or 19ft trailers and then pay monthly in advance. We do not require a credit check, but you will need to show a UK passport, 2 utility bills and a driving license. After the minimum of 8 months of the original 12month hire agreement you can choose to go for the new trailer 3 year option or the existing trailer 2 year option. When a new trailer has been hired for 2 years 11 months, or the existing hire trailer for 1 years 11 months the hirer has the option to buy the trailer for the equivalent of 1 months hire at the end of the rental period. 2. Second payment missed – 1 week added to hire agreement before purchase available. 3. Third payment missed – 2 week added to hire agreement before purchase available. 4. Fourth, Fifth & Sixth missed – 4 weeks per late week added to hire agreement before purchase available. All prices are based upon our standard specification trailer, spec available on our website. If a larger trailer or more internal equipment is ordered this will be reflected in the monthly payments. We have 10ft, 12ft, 14ft & 16ft White GRP Catering Trailers available. All dimensions are approximate and subject to change on actual trailer rented. The trailer can be plugged into mains power with suitable rating when available. 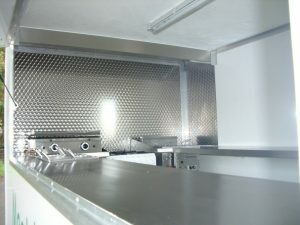 1 Serving Hatch to side, hydraulically operated, with serving shelf. 2 x 20ltr water containers, 1 for water supply to sinks, 1 for the waste water from the sinks.